Doug Proper has been playing and teaching the guitar in the tri-state area for almost two decades now. recording artist and trumpet legend Lew Soloff, CMG and Big World Music recording artist Charles Blenzig, Recording Artist Jack Wilkins, Concord recording artist Ray Vega, The Legendary Saxophonist Benny Waters, GRP Recording Artist Dave Valentine, Criss Cross Recording Artist Ralph Lalama, the inimitable Billy Mitchell, Jazz Bass Legend Bill Crow, DMP/Sharp Nine Recording artist Giacomo Gates and Saxophonist Jimmy Hill to name a few. Doug performs regularly as a solo artist as well as part of several ensembles ranging from duos to quintets with some of the most notable jazz musicians in the industry. Recently embarking on some very adventurous musical projects, one involving guitar visionary Joe Beck on Alto Guitar and drummer Gerry Fitzgerald in a trio format. Another has been a series of performances with guitar legend John Abercrombie exploring the interplay and intimacy of the guitar duo format as well as the journey into the quartet, emphasizing their contrasting styles. Most often, Doug finds himself right at home in the traditional bebop guitar/bass/drum trio featuring the areas most prominent bassists and drummers with an occasional added attraction in the addition of jazz vocalist Giacomo Gates. 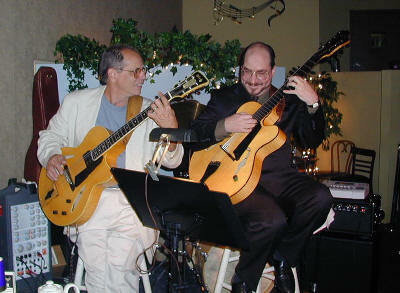 Joe Beck on Alto Guitar and Doug Proper on 7 String Playing at 17 Main Jazz Club. Playing in a duo with two guitars is fun - but playing with Joe on the Alto Guitar is an amazing experience. 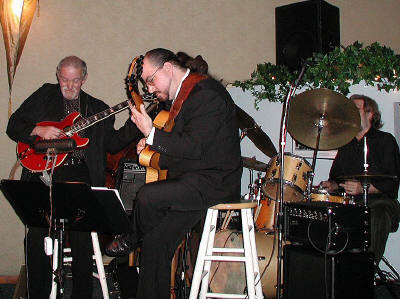 Playing with John Abercrombie is one of the most musically rewarding experiences there are. In addition to studying music at Manhattanville College, Doug attributes his distinctive command of the instrument to his studies and association with such renowned artists as Chuck Wayne, Billy Bauer, John Abercrombie, Charles LaVerne, Will Leavitt, and his long time mentor, Joe Beck. During the last few years, Doug has ventured into the realm of the 7-String guitar, after being prompted to by guitar virtuoso Jimmy Bruno. Finding the seven-string guitar more effective for his pianistic approach to the guitar, Doug plays 7-string almost exclusively. 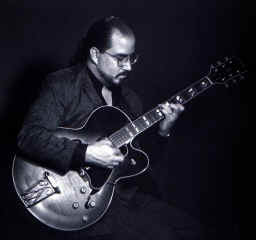 Doug also utilizes the Alto Guitar, developed by Joe Beck. Doug uses the Alto Guitar Joe Beck gave him as a gift to create a vast array of tonal colors that adds an incredible amount of depth to his music. 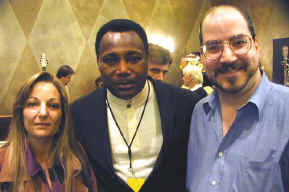 Sharon and I with George Benson at the Classic American Guitar Show. one of Dale Unger's guitars at his booth. He has performed and/or music directed in such musical theater productions as Godspell, The Wiz, Mame, Fiddler On The Roof, Anything Goes, The Will Rodgers Follies, Guys and Dolls and The Music Man. Doug continues to lead his own quartet and maintain a busy schedule as a sideman on stage and in the studio. Doug has taught music for The Lindenhurst School District, Bedford Central School District, B.O.C.E.S at Yorktown, Pleasantville High School, Woodside Elementary School and The Mount Kisco and Yorktown Schools of Music. 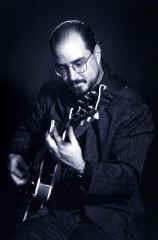 In 1987 Doug established himself in private practice under the auspices of The Guitar Specialist. In January of the year 2000, Doug closed his teaching practice to divide his efforts between the two things he loves to do the most - Play Jazz and repair and restore guitars. At night you can find him in at many of the jazz clubs in the Tri-State area and during the day you can find him in his repair shop at The Guitar Specialist.